Atrial fibrillation, in its most basic of definitions, is a form of cardiac arrhythmia or “irregular heartbeat.” A more detailed definition of this condition can be described as an arrhythmia in which the upper chambers of the heart, or atria, beat irregularly, thus potentially disrupting the normal blood flow of the heart by not allowing the lower chambers of the heart, or ventricles, to completely fill with blood. This can lead to major complications, usually resulting in the “throwing” of a blood clot, leading to strokes of an ischemic (oxygen-depriving) nature, or alternatively, resulting in heart failure due to decreased ventricular function — commonly known as congestive heart failure. Now, this arrhythmia is the most common type of irregular heartbeat worldwide, with estimates showing the affected population in the United States to be between 2.7 and 6.1 million individuals  as of 2014. Now, the difference in the conservative estimate of 2.7 million and the liberal estimate of 6.1 million demonstrates the unpredictable — and often diagnosed — nature of this condition. Atrial fibrillation can be intermittent, sensed as a bit of a palpitation or flutter in the patient, and may resolve spontaneously without any intervention whatsoever. Because of this, the afflicted patient may not seek treatment, and in turn, may never be diagnosed with atrial fibrillation altogether. These characteristics present some very unique challenges to the treatment and management of what can be a lifelong condition. First, it is important to understand the differing variants of atrial fibrillation, and what each type entails. The American Heart Association classifies atrial fibrillation in the 2014 AHA/ACC/HRS Guidelines into several distinct iterations of the condition. With paroxysmal atrial fibrillation, “the faulty electrical signals and rapid heart rate begin suddenly and then stop on their own.” Generally, paroxysmal atrial fibrillation can be erratic and will stop in less than a week. However, most episodes convert back to the heart’s normal rhythm, called sinus rhythm, within 24 hours. The challenges with treating this variant of atrial fibrillation rest mainly on correct identification and diagnosis. Because of the erratic and spontaneous nature of this type of atrial fibrillation, patients may go years without a correct diagnosis, despite maintaining regular health maintenance visits with their primary care physician. Many times this will occur because the patient is not in atrial fibrillation at the time of the scheduled appointment, and with good vital signs, the brief episode of palpitations may slide under the proverbial radar as simply an anxiety attack. Many times, this spontaneous irregular heartbeat will cause a thromboembolic event, leading to a series of different possible ischemic strokes. However, if paroxysmal atrial fibrillation is diagnosed, the treatment options are many, with conservative, medical management being the most preferred method of treatment. Conversely, with persistent atrial fibrillation, the abnormal rhythm continues uninterrupted for more than a week. This too has the potential to abruptly convert back to normal sinus rhythm. The persistent nature of this variant is more easily identifiable — and therefore, treatable — than paroxysmal atrial fibrillation. Healthcare providers are able to identify the rapid rate via standard pulse readings, visualize the irregularity through ECG, diagnose persistent atrial fibrillation through subjective and objective examinations, and properly treat the symptoms. The same risks are associated with both the intermittent and persistent types of atrial fibrillation, with the former representing a more challenging presentation than the latter, due to missed diagnoses and sporadic symptomatology. Finally, permanent atrial fibrillation occurs when sinus rhythm cannot be restored, even with treatment. It is important to note that both variants above have the possibility to progress in frequency as time moves along, resulting in this permanent arrhythmia. When a patient reaches this point, the normal methods of treatment, including anticoagulation and rate/rhythm control medication as well as more invasive methods, have failed to reduce the patient’s symptoms, and the decision has been made by the patient and provider not to attempt restoration of sinus rhythm whatsoever. At this point, the patient’s life quality can diminish, and the patient may feel increasingly tired, out of breath, and lifeless. When these symptoms become omnipresent, there is a good chance that the patient’s heart has become weak, enlarged, and unable to pump out precious oxygenated blood into the body. The end result here is congestive heart failure, which can only be cured by heart transplantation, although symptomatic treatment is available. As noted above, the two main complications that can arise from atrial fibrillation are stroke and congestive heart failure. The majority of the population is familiar with these two conditions, but in order to understand the risks associated, it is important to understand the etiology of both of these when in the setting of atrial fibrillation. As such, congestive heart failure occurs when the heart is overworked. 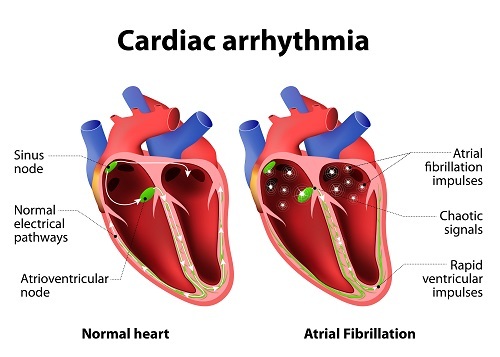 In the setting of atrial fibrillation, the irregular and erratic impulses that cause the arrhythmia cause the heart to work too hard, rendering it enlarged, ineffective, and weak. When atrial fibrillation compounded with other heart problems, such as valvular disease and aortic stenosis, the resultant congestive heart failure becomes increasingly severe and hard to treat. As the heart is unable to pump out the oxygenated blood, the lungs begin to fill with fluid in a condition called pulmonary edema. This causes fluid retention throughout the body, but mainly in the lower extremities. When this happens, electrolyte balance can be significantly out of control, leading to very serious conditions such as toxic metabolic encephalopathy. Weight gain, shortness or breath, and extreme fatigue are also symptoms. In order to treat this, providers must decrease the fluid retention. This is done by using diuresis to rapidly eliminate the fluid through reducing the volume of fluid in the body by increasing urination. The risk of complication with diuresis is significant, in that if a patient is over-diuresed, damage to the kidneys can easily occur. Therefore, as evidenced by this lone example of the many complications that can arise in treating congestive heart failure, it becomes clear that this is one of the most significant — and life-threatening — conditions that can develop as a progression of disease due to atrial fibrillation and its increased stress on the heart. Additionally, stroke is the other major, life-changing, medical condition that can occur as a result of atrial fibrillation. However, different than congestive heart failure, the cause of an acute stroke in the setting of atrial fibrillation does not occur as gradual and systematically as the weakening of the heart with congestive heart failure, but rather, it is spontaneous and unpredictable by the very nature of the physiology of the event. That is to say, every time the heart converts into atrial fibrillation, the atria has a very high probability of pooling blood, as the normal cycle of pumping to fill the ventricles is interrupted. This pooled blood had the potential to begin coagulation — forming a clot. Once a clot is formed in the heart, there exists a very real, highly-probably chance of said clot “breaking off” or “throwing,” which releases one or several into the arterial circulatory system. What happens next literally amounts to a stroke of good luck or a stroke of bad luck, no pun intended. The clot can block off one of the arteries leading to the blood flow in the brain, causing cerebral ischemia — a stroke. In this case, the size of the clot determines the severity of the stroke. In some instances, the stroke can occur as a sudden, debilitating loss of speech and motor function, but in other cases, these clots can block smaller vessels in the brain, and the loss of function is not as pronounced and/or more gradual. However, while the extent of the damage is generally the gold standard in determining the severity of the attack, it is just as equally important to understand that, in most cases, this damage cannot be reversed. The patient may end up with a condition known as hemiparesis, where one side of the body is affected and the other side functions normally. With that said, it is important to understand the multiplicity in stroke probability that exists as a result of atrial fibrillation. While statistical data suggest that a person with atrial fibrillation is five times more likely to have a stroke, a more realistic understanding is possible when considering that each time the heart experiences arrhythmia from atrial fibrillation, there exists a very good possibility of a clot being “thrown” and causing a stroke. In fact, many patients who experience this phenomenon can be treated for atrial fibrillation for years, have successful procedures and underestimate this risk. The same patients can be discharged from the hospital in stable condition, only to have a massive stroke the following day from a brief episode of atrial fibrillation. Fortunately, there are many treatment options that can be employed when atrial fibrillation is diagnosed which act as stroke-prevention agents by keeping the heart at a regular rate and rhythm, thereby practically lowering the risk back to that of a patient who does not suffer from arrhythmia. As mentioned above, there are many different treatment options available for the patient who suffers from atrial fibrillation. These range from medical management and conservative treatment to semi-invasive techniques such as cardioversion, to even more invasive procedures with very high cure rates, such as catheter ablation or pacemaker/AICD (Automatic Implantable Cardioverter-Defibrillator) implantation. The clinical indication for each type of treatment is a very individualized approach, as not everyone with atrial fibrillation is a candidate for the cure procedure – nor does every candidate wish for invasive treatment. The most prominent and preferred approach to treatment by providers and patients alike is conservative medical prevention. Using this technique, patients are started on a medical regimen that usually consists of a medication to thin the blood (an anticoagulant, such as warfarin), along with a rate-control medication (beta-blockers such as metoprolol), and rhythm-control medications (such as amiodarone). Additionally, cholesterol-lowering medications known as statins, are routinely introduced as a secondary prevention strategy to decrease stenosis of the blood vessel walls, as is caused by the accumulation of LDL-type cholesterol. For many patients, this type of prevention regimen works amazingly well. However, as with all medications, there exists the chance of severe side effects occurring. With these types of regimens, the most serious and common side effect can be the increased risk of bleeding associated with the anticoagulant medications and risk of major long-term complications associated with amiodarone, including lung toxicity. Therefore, it is very important that the provider treating the patient have a clear picture of the individual’s overall health, so as not to prescribe a medical regimen that is contraindicated with another condition. Unfortunately, conservative medical management is not indicated for and is not effective for every patient with atrial fibrillation. In many instances, a patient will have palpitations so severe that he/she feels it necessary to sojourn to the emergency room for treatment. At this point, the decision will be made to start the patient on medical management or to hold medical management. In the event that the medication is not working or is not indicated, another option is a procedure known as electrical cardioversion or electrocardioversion. This is a planned procedure, many times done in a specialty suite (electrophysiology suite), where the heart is effectively shocked back into normal sinus rhythm, using the same logic behind the electrical impulses used in AED devices to deliver shocks to restart a heart that has stopped beating during defibrillation. The main difference between these two techniques is that electrocardioversion delivers the electrical impulse at a specific portion of the cardiac cycle, whereas resuscitation is deployed at a random point of the same. If not done in an emergent manner, it is ideal for the patient receiving electrocardioversion to receive anticoagulation therapy for some period of time before the event to ensure that there are no clots that may break away during the procedure. Electrocardioversion can be very effective for converting back to normal sinus rhythm, although sustained maintenance of sinus rhythm with this procedure is only around 20% to 30%, but increases when rate-control medications are taken afterward. Conversely, the invasive forms of treatment are generally done when conservative management has failed, the patient is not indicated for conservative management, or the patient has the desire to attempt to cure the underlying etiology of the atrial fibrillation above all else. The two main types of these invasive treatments are known as ablation or AICD/pacemaker device implantation. Both are performed via cardiac catheterization, in which an instrument enters the heart through a hollow catheter that is introduced through a blood vessel in the femoral or groin area. With ablation, the electrophysiology specialist will attempt to find the defect in the heart that is causing the irregular rhythm and will then attempt to destroy – or ablate – the defect. When this can be performed safely and successfully, the rate of cure for atrial fibrillation is very high. Unfortunately, this is not a procedure that is indicated in every situation, as much depends on the location and type of defect as well as safety protocol. Additionally, another permanent form of treatment is the implantation of an automatic implantable cardioverter-defibrillator device (AICD). The leads of this are delivered peripherally into the heart, usually via a subclavian portal, and the device is implanted under the skin on the patient’s chest. This device has the ability to monitor for changes in rhythm and electrocardiovert the heart back to normal sinus rhythm upon detection of the arrhythmia. The major drawback to this procedure, besides the surgical portion involved, is the size of the device, which becomes clearly visible and protrudes from under the patient’s skin. However, it is likely that as technology advances and components are reduced in size, this aesthetic drawback will become nonexistent. The function provided by an AICD does not cure the underlying cause of the atrial fibrillation, but rather corrects the rhythm in an instant. January CT, Wann LS, Alpert JS, Calkins H, Cigarroa JE, Cleveland JC Jr, et al. 2014 AHA/ACC/HRS guideline for the management of patients with atrial fibrillation. Journal of the American College of Cardiology. 2014;64(21):2246–80. 2014 AHA/ACC/HRS Guidelines for the Management of Patients with Atrial Fibrillation <http://circ.ahajournals.org/content/early/2014/04/10/CIR.0000000000000041.full.pdf >, Circulation, 2014; published online before print March 28 2014, doi:10.1161/CIR.0000000000000041. National Heart, Lung, and Blood Institute (2014). Atrial Fibrillation. Retrieved from: https://www.nhlbi.nih.gov/health/health-topics/topics/af/types. StopAfib.org. Why is Atrial fibrillation a Problem? Retrieved from: http://www.stopafib.org/why.cfm. 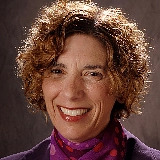 Russo, Andrea M., MD, “Overview of the Contemporary Evaluation and Management of Patients with Atrial Fibrillation: What Every General Practitioner Should Know”, American Heart Association, Copyright, 2006.